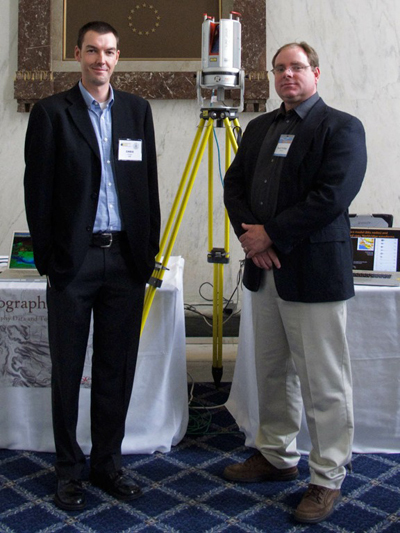 UNAVCO’s David Phillips gave a Terrestrial LiDAR Scanning (TLS) demo on Capitol Hill in Washington, DC, as part of the 15th Annual Science-Engineering-Technology Congressional Visits Day (CVD) and LaserFest Reception. Phillips performed LiDAR scans of several congressional representatives and other attendees at an evening reception on Wednesday, April 28, 2010 in the Rayburn House Office Building. UNAVCO and OpenTopography were invited to participate in the event by the American Geological Institute (AGI). The 2010 CVD coincided with activities for LaserFest, a yearlong celebration of 50 years of laser innovation. 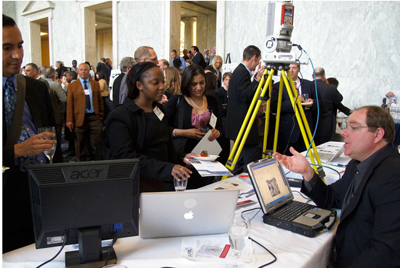 The UNAVCO LiDAR exhibition was aimed at Members of Congress and their staffs with the goal of highlighting the importance of federally-funded research and its role as a driving force behind the United States’ economic growth. The LiDAR demo offered reception attendees a fun, interactive way to learn about new geoscience technology and a chance to network with organizations like UNAVCO that are advancing science research around the globe. During the reception, the George E. Brown, Jr. Science-Engineering-Technology Leadership Award was presented to The Honorable David Wu, Chair, Subcommittee on Technology & Innovation, House Committee on Science & Technology and The Honorable Ralph Hall, Ranking Member, House Committee on Science & Technology. Congressional Visits Day (CVD) is a 2-day annual event that brings scientists, engineers, researchers, educators, and technology executives to Washington to raise visibility and support for science, engineering, and technology. Uniquely multi-sector and multi-disciplinary, CVD is coordinated by coalitions of companies, professional societies and educational institutions. Special thanks to Corina Cerovski-Darriau and Linda Rowan of AGI for including UNAVCO in this event and for organizing the logistics. OpenTopography has also posted a highlight online here. What is Terrestrial Laser Scanning? Terrestrial Laser Scanning (TLS) is a 3D imaging technique based on Light Detection and Ranging (LiDAR) technology. TLS is part of a suite of new geodetic and imaging technologies that are becoming increasingly important to the Earth sciences community for use in myriad research applications. Also known as ground based LiDAR or tripod LiDAR, TLS offers an unprecedented capability to image at centimeter-level resolution 2.5-dimensional surfaces such as topography and fully 3-dimensional shapes such as cultural objects or rock or ice outcrops with overhanging features. TLS instruments are extremely precise, reasonably portable, relatively easy to operate, and have been used successfully to support a wide range of geoscience investigations including detailed mapping of fault scarps, geologic outcrops, fault-surface roughness, frost polygons, lava lakes, dikes, fissures, glaciers, columnar joints and hillside drainages. Moreover, repeat TLS surveys allow the imaging and measurement of surface changes through time, due, for example, to surface processes, volcanic deformation, ice flow, beach morphology transitions, and post-seismic slip. TLS is applicable to problems with areal extents at the 10 meter to kilometer level where detailed analysis is needed. Concurrent GPS measurements can provide accurate georeferencing of the TLS data and absolute 3D coordinates. Coincident high-resolution digital photography allows for the generation of photorealistic 3D images. TLS measurements complement airborne and spaceborne LiDAR and SAR measurements by providing smaller-scale, higher-resolution plots of important areas and by filling in areas inaccessible by these other techniques. Supported by the National Science Foundation, UNAVCO TLS instruments and personnel have supported research projects related to the above applications throughout the U.S., Mexico (following the magnitude 7.2 Sierra El Mayor earthquake of April 4th, 2010), Iceland and Antarctica. TLS is also a unique and powerful tool for advancing Earth science education and outreach. UNAVCO provides community training workshops and supports undergraduate education programs in order to introduce this technology to current and future generations of researchers. In November 2009 UNAVCO purchased three new TLS instruments: one Riegl LMS-Z620, one Riegl VZ-400, and one Leica ScanStation C10. Each of these instruments, acquired through NSF funding, have unique capabilities and together represent a well rounded suite of instruments that will allow UNAVCO to support a diverse range of projects. One Optech ILRIS 3D, which UNAVCO acquired previously to support polar projects, will also continue to serve as part of the pool. The new instruments are fully commissioned and available to PI’s. The Optech ILRIS 3D is currently deployed and is seeing constant use in Antarctica. In addition to these scanners, UNAVCO has NSF funding to acquire two additional new scanners in 2010. One of these two future systems will be part of the UNAVCO pool year-round while the other will be a shared resource with Central Washington University. In addition to UNAVCO owned and managed scanner pool, additional scanners with different capabilities can also be made available through community projects such as INTERFACE and individual universities. UNAVCO provides support for Terrestrial Laser Scanning (TLS) projects through the following services: project planning, proposal preparation, instrumentation and engineering support, education and outreach activities, and other services currently under development. TLS support resources are rapidly evolving at UNAVCO. For additional information regarding TLS support please email projects unavco.org or contact Dr. David Phillips, Geodetic Imaging Project Manager at UNAVCO, phillips unavco.org. 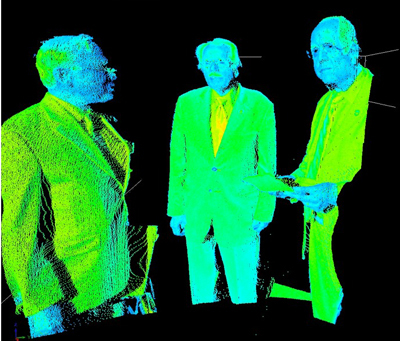 Figure 1 - TLS LiDAR scan showing 3D image of members of congress, including Rep. Roscoe Bartlett (R-MD) (middle). View more JPEG versions of the LiDAR scans here. Figure 2 - David Phillips of UNAVCO educates reception attendees about Terrestrial Laser Scanning. Image courtesy Linda Rowan (AGI). View more photos here. Figure 2 - Chris Crosby (OpenTopography) and David Phillips (UNAVCO). View more photos here.